Dit jaar zal Nederland weer goed vertegenwoordigd zijn op de HANNOVER MESSE. De industriebeurs, die dit jaar door de Amerikaanse president Barack Obama en de Duitse bondskanselier Angela Merkel zal worden geopend, kan naar verwachting rekenen op 180 Nederlandse exposanten. Nederlandse ondernemers, kennisinstellingen en overheid slaan de handen ineen om de Nederlandse High Tech- en Energiesector goed op de kaart te zetten tijdens de HANNOVER MESSE 2016. Using the slogan ‘Global Challenges, Dutch Solutions‘, The Netherlands is partner country of the Hannover Messe 2014. An overview of some Dutch solutions is presented in the video below. Why invest in the Dutch high tech sector? During the Hannover Messe, the Netherlands Foreign Investment Agency (NFIA) organizes an investment seminar. Visit this event to learn why to invest in the Dutch High Tech Sector and get an overview of leading Dutch Technology and partnership models. During the event a German investor in the Netherlands shares his experiences in a panel discussion. The seminar is wrapped up by the Dutch minister of Economic Affairs, Mr. Henk Kamp. The seminar takes places on Wednesday 09-04-2014, from 03:00 PM-04:00 PM. Location: Hall 3, Stand F20, Holland Pavilion (Glass House). Registration via e-mail: roy@nfia.nl Additional information is enclosed below. Comments Off on Why invest in the Dutch high tech sector? 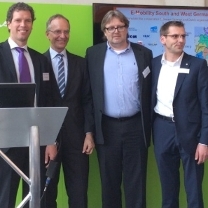 This year, the Netherlands is partner country of the Hannover Messe. Don’t miss a thing and download the lengthy, full program via this link. Over the next days this blog will be continuously updated to put a spot light on some of the interesting events and innovations that will be organized and shown in the Holland Pavilion and in the other halls that the Netherlands is present in. In 2014 is Nederland partnerland van de Hannover Messe, de belangrijkste industriële vakbeurs ter wereld. Dat maakte de organisatie van de Hannover Messe 26 augustus 2013 bekend.